Jawwal Company has sponsored the launch of the "Hackathon"
Jawwal Company started the year with the Hackathon competition event for developing mobile applications, implemented by PalTel Group Foundation for Community Development, the developmental arm for PalTel Group and its companies (Jawwal, PalTel, Hadara, Reach, Palmedia). The competition took place at Jawwal headquarters in Al-Bireh. Jawwal Company has sponsored the launch of the "Hackathon" competition for developing mobile phone applications. 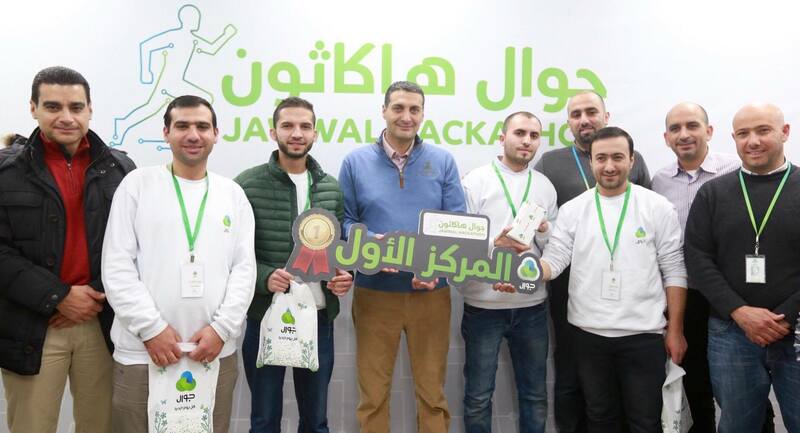 Jawwal Company started the year with the Hackathon competition event for developing mobile applications, implemented by PalTel Group Foundation for Community Development, the developmental arm for PalTel Group and its companies (Jawwal, PalTel, Hadara, Reach, Palmedia). The competition took place in Jawwal headquarters in Al-Bireh. The competition targeted youth groups interested in the field of smart applications, business entrepreneurs, startups, and small/medium companies who seek to develop their businesses. The competition aimed at strengthening the spirit of sharing, perseverance, creativity, teamwork, and development of entrepreneurship in the field of information technology. 80 young people participated from West Bank and Gaza Strip, to compete within forty-eight hours for launching new applications that can serve the Palestinian community. Jawwal, within its social responsibility and community empowerment through providing opportunities for young people to present and market their ideas. Mr. Abdul Almajeed Melhem, General Manager of Jawwal Company stated, "We believe in giving the youth the opportunity to be creative in the field of mobile applications, which enriches the technology sector in general. We are committed to helping successful entrepreneurial ideas by supporting and adopting some of these projects, developing them to become productive projects in the Information Technology field and open real opportunities for the youth, also the Palestinian economy can benefit in return". Mr. Melhem added “The technology sector has become the prominent sector that has the world’s attention, as the world is competing to develop this field, as a result of the fast developments in new technologies and mobile applications, which became the center point of people’s daily lives to reduce the time and effort ". Pointing out that the main objective of the competition is to give an opportunity for entrepreneurs to put forward their ideas and bring their ideas to light. This will give them the opportunity to market their ideas and implement their ideas. Ms. Samah Abuoun Hamad, the General Manager of Paltel Group Foundation for Community Development stated that the competition will occur during three days period, starting on Thursday 12/1/2017 at 4:00 pm until Saturday 14/1/2017. The target groups, who have the needed skills for programming, business development, marketing, and sales, will compete during this period where we provided specialized mentors to assist and oversee their work. The contestants will present their work in front of a specialized panel to select the winners. Prizes will be awarded to the successful ideas in a special ceremony for announcing the winners. It is worth mentioning that Jawwal is the leading company in the field of technology in Palestine and main sponsor for several IT events such as "Hour of Code" campaign and "We code" during 2016. In addition to a number of smart applications provided by the company through its website and its customer services list. Ramallah: Jawwal Company has announced the students who won at the "Hour of Code” competition, which has been carried out for the third year in partnership with the Ministry of Education and Higher Education, and implemented by PalTel Group Foundation; the developmental arm of PalTel Group and its companies (Jawwal, PalTel, Hadara, Reach, Palmedia). Ramallah: Jawwal Company has announced the students who won at the "Hour of Code” competition, which has been carried out for the third year in partnership with the Ministry of Education and Higher Education, and implemented by PalTel Group Foundation; the developmental arm of PalTel Group and its companies (Jawwal, PalTel, Hadara, Reach, Palmedia), they announced the names of the winners during a ceremony that was held at Jawwal Company in Ramallah. The Minister of Education and Higher Education, Dr. Sabri Saydam; Minister of Communications and Information Technology Dr. Allam Mousa; CEO of Paltel Group, Mr. Ammar Aker, and managers from the Ministry of Education, Ministry of Communications and PalTel Group. The Minister of Education and Higher Education Dr. Sabri Saydam stated “We are pleased to meet you all today to announce the names of the winners in “hour of code” campaign, which was commenced in a modest approach. As we now stand on the threshold of a crucial crossroad in the Palestinian academic life, so we have decided that the programming is becoming an integral part of the educational process." Dr. Saydam stressed the importance of partnership between the public and private sector to commit to the Palestinian expertise in the field of programming and communication, which would be competent to compete with the international expertise in the field. Affirming that we will adopt the programming study in the academic system; therefore we have decided to expand the “Hour of Code” campaign throughout our schools. Starting with the adjustment relative to the school schedule of the participating schools; which will contribute to a curriculum aimed to brighten the future of our students. In conclusion, we would like to thank PalTel Group for its efforts in the implementation of special technology development and digitization of education programs. The Minister of Communications and Information Technology Dr. Allam Musa, stated, "This competition is aimed at broadening the students’ knowledge and their capabilities to programming field, in order to attain a studious thinking to shape their future life, adding, "We are keen to support such initiatives that contribute to the evolution of the technology sector in Palestine." He indicated the role of the ministry is to provide a number of schools with computers. He also stressed at the cooperation between the Ministry of Education, and the International Telecommunication Union to establish a smart class; which will be a different pattern in schools and universities, in order to build a digital society able to develop and an advanced livelihood. He also acknowledged PalTel group for its efforts in placing Palestine on the world map. Mr. Ammar Aker, CEO of PalTel Group stated, "We thank the Ministry of Education and Higher Education and its Minister, Dr. Sabri Saydam, also we thank the Ministry of Communications and Information Technology, led by Dr. Alam Musa on their continuous cooperation and efforts in developing the e-learning sector in Palestine. With that being said, he confirmed that the programming sector is wide range due to the spread of modern technology and the increasing youth interest in modern information and software technology. It has become an essential building block for the development of all sectors, it was necessary to encourage student talent within schools through this program, which aims to encourage them to learn programming and professionalism in the future. Mr. Aker pointed out that the interest of PalTel group in this program aims to develop the cognition and the logical analysis of the students in an early age, which will help them to choose scientific disciplines in the future, which will provide suitable operational opportunities in the local, regional and global market, stating that he will be signing an agreement with the Ministry of Education and Higher to adopt “Hour of Code” campaign as an annual event and lasting program under the programs that sponsored and supported by the Ministry of Education and Higher Education in its efforts to develop the education sector in general and the technology sector in particular, because of its importance in the development of all operating segments of society. According to Mr. Aker, through the program there has been training new graduates to visit schools and make a presentation about the program and how to apply in all provinces of the country. 18 graduates worked on the program this year with an average of 72 working hours, and more than 20,000 students from West Bank and Gaza schools participated in the campaign. Mr. Abdul Almajeed Melhem, General Manager of Jawwal stated, “ we were happy for the third year in a row to host more than 500 students from the provinces of the country in Jawwal headquarters to attend the "Hour of Code" campaign, which aims to motivate students to learn the basics of programming in an easy and fun way. the target is to build a new generation of students who have the ability of leadership in programming. With that being said, PalTel Group Foundation for community development, the implementer of this program worked on developing the competition to increase the participation of students through the competition in the field of programming with the collaboration of the Ministry of Education. PalTel Group Foundation searched throughout all districts for eligible participators for the competition and conducted a championship for schools to determine the three winning teams. This approach was used to be able to choose persons with higher levels of programming and methods of analytical thinking to the problems. That being said, they will announce three winners from the 17 teams, who competed in the qualified schools from all districts, and they will be awarded.